Ken Budd’s book The Voluntourist—A Six-Country Tale of Love, Loss, Fatherhood, Fate, and Singing Bon Jovi in Bethlehem, has been nominated in the nonfiction category for the 16th Annual Library of Virginia Literary Awards. The awards were created to honor Virginia authors, their publishers, and their literary contributions. Ken is a lifelong Virginian, and the state is a thread throughout the book. Finalists for the award will announced in August; an event will be held in Richmond in October. 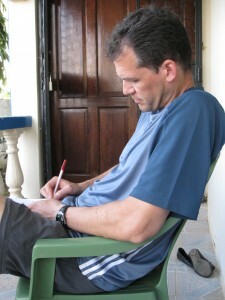 You can follow Ken Budd on Facebook and Twitter: @VoluntouristKen.